An enduring family fishing tradition that began years ago coincided with the rise of Instagram, that popular selfie-sharing, food-posting, cat and dog-loving social media platform. 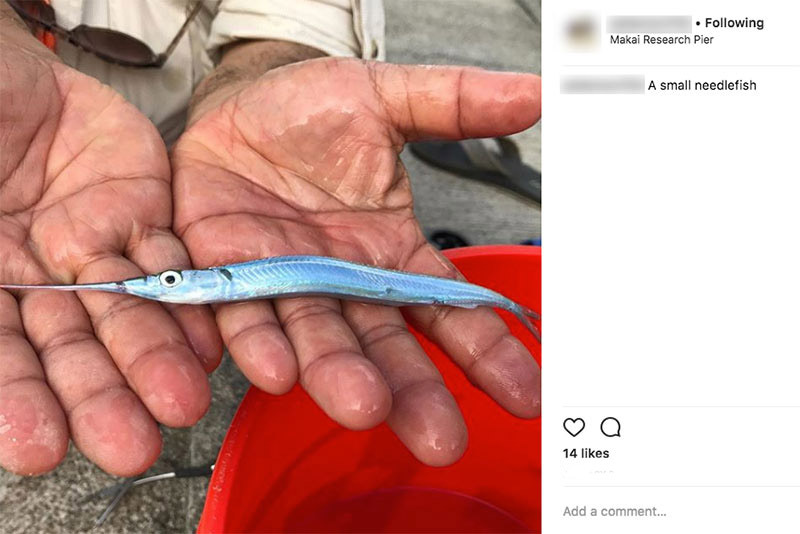 When Little Girl was, well, little, I began taking her to fish for reef denizens at the Makai Research Pier in Waimanalo, a short 20 minute drive from home. It was strictly catch and release with a little bit of marine science and biology thrown in. We used a short light action fiberglass hand pole about three feet in length. I tied on a heavily tapered length of hand-tied leader, about 12 feet long so she could reach bottom from the pier. This terminated in an 18 inch length of 6X or 7X (roughly between 3-1.5 pound test) and depending on the size of the species we were after, a size 24 to size 32 barbless nymph hook tipped with raw shrimp. 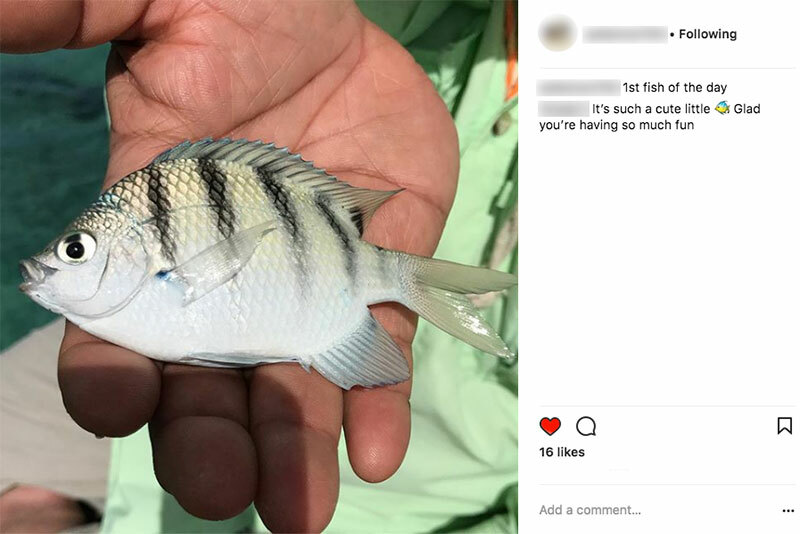 When she got her Instagram account, the fishing posts took off. Our trip always began the same way. After a quick stop to pick up lunch at some local eatery along the way, we plopped down on the pier and chowed down on the food while checking on the targets swimming below or the scenery in front of us. The Makai Research Pier is the home base for a wide variety of underwater research equipment and features a huge barn facility to refit Pices-class submersibles. The facility also handles a wide range of experiments including detailed testing of large multi-component underwater arrays. The pier is open to the public for fishing and many families can be found there wetting a line, chasing a variety of species that make their home on the nearby reefs or in the deep sand channel used to load and unload heavy equipment and submersibles. She has very good reflexes and after a short while we started catching fish. Every day we would fish there, we would catch something different in different quantities. On one day it was a ton of wrasse. On another it was majority Sergeant Majors. She would also catch some very difficult fish to hook, like colorful butterfly fish with tiny, tiny mouths. Micro-sized filefish and triggerfish, needlefish and an assortment of tiny Jacks. She even caught one of the rarest of the rare without using a fishing pole or bait. It was towards the end of the day and fishing was slowing down. I was messing around adjusting the tippet and retying a new size 32 hook when she spotted a small black plant pot drifting towards the pier. We had a small bucket tied to a line that I used to haul up salt water to fill our five-gallon temporary holding/unhooking bucket. She managed to capture that small plant pot and brought it up to the pier. I was still working on her line when she asked me if seaweed can swim. She brought over the small bucket. She said when she removed the planter, this small bit of “seaweed” fell out and began swimming around in the bucket. 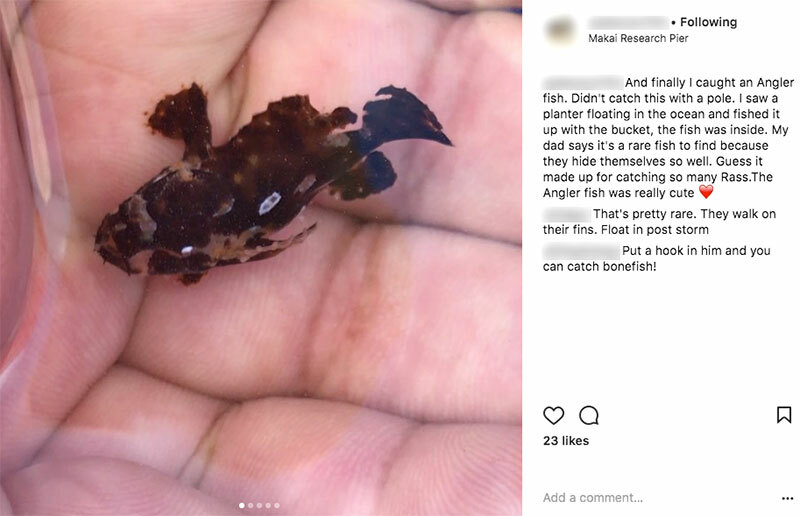 It was a tiny angler fish, or Frogfish, about an inch and a half long. Its camouflage perfectly matched the black mottled planter. We had a brief pier-side zoology lesson on the feeding habits of this ambush predator before we released it. In the end, after a long, hot afternoon of fishing, we would feed the remaining shrimp to the reef people then head to the Hawaii Kai Shopping Center to cool off with an ice cream cone from Bubbies. DIRECTIONS: The Makai Research Pier is located at 41-305 Kalanianaole Highway in Waimanalo. The pier is open to the public for fishing from 8am to 5pm, Monday thru Thursday, on Friday only, it is open from 8am to 12am (for night fishing) and from 10am to 5pm, Saturday and Sunday. Parking is extremely limited! There is no official parking lot with marked spaces and private cars are not allowed on the pier. EQUIPMENT: We used a small light action fiberglass straight pole with a leader 12 feet long tapered to either 6X or 7X with small split shot to get the bait down fast. Hooks were between size 24 to size 32, depending on the species we were after. A tiny piece of raw shrimp was the bait of choice.